Many other tools allow as well the knowledge tree, and the keys, and the ideas connected to papers, and citation texts connected to papers. So these things don't make CITAVI different from other citation tools. Neither improved citation style editor does. Automatic creation of the BibTex is a great feature which save a lot of time. 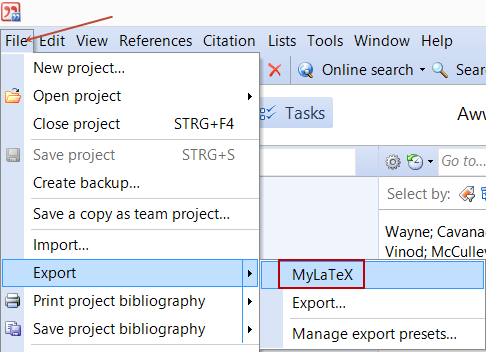 I can work just with the interface and add required citations in the tex/word and than just one click and all needed citations are exported. So if you delete a feature that was earlier in the program, please say this. i converted all my citations to citavi4 and add other information before i saw that it doesn't support automatic export and now i can not convert ctv4 in ctv3, but it is another reason to be angry. So i'm wondering as well what is the software development process you are following viewtopic.php?f=29&t=5621 as IT IS NOT OK just TO DELETE the features and DO NOT PROVIDE its substitutions. I hope that the feature will soon appear in the fix. I am sorry that you need this feature so much. As a matter of fact, it is a feature that created quite a lot of confusion for some LaTeX users, so we decided to suspend it for the time being. 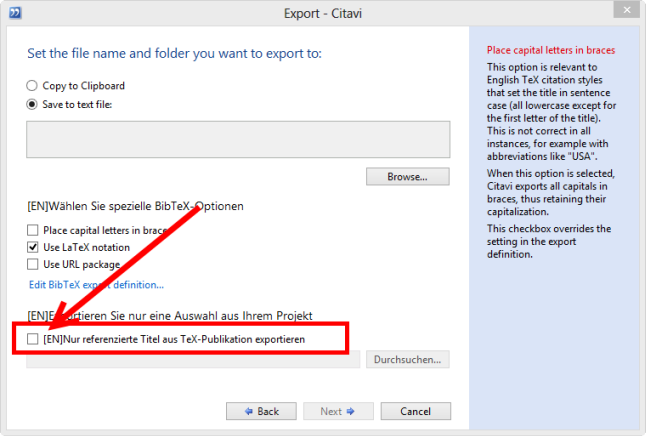 What is wrong with the possibility to export all the titles in your Citavi project to a BibTeX file? If you do that right after you added the BibTeX key to your LaTeX document, and if you drag the title on the category in the 4th column on the left (Alt+5) it is no much of an extra effort. By clicking on this category in Citavi, only those titles are shown which have this category. You can then export all those titles to your BibTeX file via the preset in File > Export. I totally agree with petrushyna. The Automatic BibTeX-Export was a great feature of Citavi that I used regularly to prepare my Latex publications. The work-around that Patrick suggests may be okay when starting a new publication. When continuing with an old project it would mean too much extra work. Consequently, I will have to export all of my references (>3,000) when working on older projects which takes considerably more time than the Automatic BibTeX-Export. This is a substantial flaw in Citavi 4 that makes me regret that I have upgraded to the new version. I hope this will be fixed. As this is a beta version, the option has not yet been translated into English. We're very sorry for the frustration the removal of this feature caused! Thanks so much for sharing your feedback so we knew how important it was! It is great. I'll try it now and let you know if anything. @Philip thanks for support and i agree with your point as well. i have 15.000 references! @Jeniffer thanks for hearing us! Thanks for your comments! Yes, I can see how it's a little confusing that there's a checkbox, when it might seem that by not checking it you would be able to export all publications. At the moment the only option is to export the references in the TeX file. I'll add your suggestion to change this back to the way it was (while keeping the current location) to our wishlist.